When you need to repair a shore line, this is the most cost effective approach, beach replenishment consists of pumping sand onto the upper beach and building sand dunes. In some cases sand can be trucked in, its all determined by site conditions and what the homeowners expectations are. Beach replenishment for homeowners of beach front property’s can be costly. In most cases only the upper beach is covered with new sand, so that in effect, a shallow flat and/or a steep beach is created. 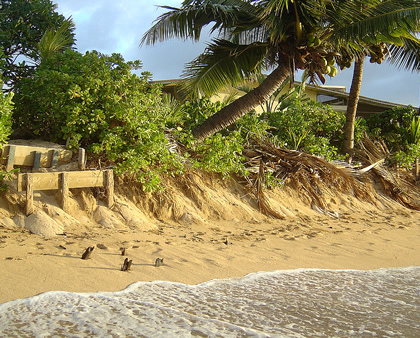 The new steepened profile can and will in most cases increases the rate of erosion (site conditions determine elevations of new sand beaches). Shoreline Engineering is a phrase referring to any method of changing or altering the natural shoreline system in order to stabilize it. Methods of stabilizing shorelines range from the simple planting of dune grass to the complex emplacement of large seawalls using draglines, cranes, and bulldozers. The benefits of such methods are short-lived if site conditions are not carefully considered. Florida Beach Repair, shoreline engineering may should only be conducted by experienced Engineering Companies. Foundation Masters, LLC will be happy to give you a FREE consultation for all your shoreline engineering and shoreline construction needs. For more info on Florida Beach Erosion and permitting your beach repair project call us. Click the interactive map to see if your project will require a Coastal Construction Control Line (CCCL) permit.